Discounted! Now $10 per copy, or $8 per each for orders of 10 or more. Order! What: A call for art and article submissions for the 2020 Certain Days: Freedom for Political Prisoners Calendar. The Certain Days: Freedom for Political Prisoners Calendar collective (www.certaindays.org) is releasing its 19th calendar this coming fall. The theme for 2020 is “Knitting Together the Struggles,” reflecting on the ways that different movements and groups can work toward a common goal of liberation. We are looking for 12 works of art and 12 short articles to feature in the calendar, which hangs in more than 5,000 homes, workplaces, prison cells, and community spaces around the world. We encourage contributors to submit both new and existing work. We especially seek submissions from prisoners – please forward to any prison-based artists and writers. We often talk about the importance of “intersectionality” in our social justice work, but are we really practicing it? We have been inspired by examples of organizing that reaches across borders, across generations, across struggles. At the same time, we have seen groups confronted with major splits based on miscommunication, privilege, competing needs, and incompatible visions. How can we address these very significant challenges in working to build a better world, together? What historical and current successes or missteps can we learn from? We would love to hear practical examples of groups who are grappling with these ideas and making new connections. • 500 words max. If you submit a longer piece, we will have to edit for length. • Poetry is also welcome but needs to be significantly shorter than 500 words to accommodate layout. • Please include a suggested title. 2. We are interested in a diversity of media (paintings, drawings, photographs, prints, computer-designed graphics, collage, etc). 3. The calendar is printed in colour and we prefer colour images. Due to time and space limitations, submissions may be lightly edited for clarity, with no change to the original intent. 1. Send your submissions by May 17, 2019 to info @ certaindays.org. 2. ARTISTS: Please send images smaller than 10 MB. You can send a low-res file as a submission, but if your piece is chosen, we will need a high-res version of it to print (600 dpi). 3. You may send as many submissions as you like. Chosen artists and authors will receive a free copy of the calendar and promotional postcards. Because the calendar is a fundraiser, we cannot offer money to contributors. 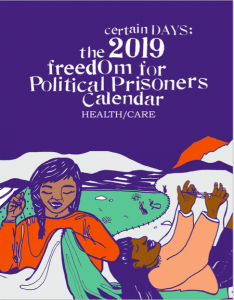 The Certain Days: Freedom for Political Prisoners Calendar is a joint fundraising and educational project between outside organizers in Montreal, Hamilton, New York and Baltimore, with two political prisoners being held in maximum-security prisons in New York State: David Gilbert and Robert Seth Hayes. The initial project was suggested by Herman Bell, and has been shaped throughout the process by all of our ideas, discussions, and analysis. All of the members of the outside collective are involved in day-to-day organizing work other than the calendar, on issues ranging from refugee and immigrant solidarity to community media to prisoner justice. We work from an anti-imperialist, anti-racist, anti-capitalist, feminist, queer and trans positive position.